5 ways walking can help you navigate self-care. Walking strengthens your physical fitness. But it’s also a great way to care for your mind! 5 Ways Walking Can Help You Navigate Self-Care for Your Mind. Taking a walk is a simple yet powerful way to strengthen physical fitness. But as much as I appreciate the ways my body benefits from walking, that’s not really why I make sure to walk every single day — no matter where I am or what the weather is like. The real reason why walking is an indispensable part of my self-care routine is because it leads my mind down the right path. Walking sets my day off in the right direction by helping me focus on what matters most in the morning. When stress sends my mind spinning around in the afternoon, a brief walk helps me course-correct. In the evening, walking helps me navigate the transition between waking and sleeping hours by promoting relaxation and reflection. Walking promotes a sense of peace by relaxing your mind. A Princeton University research study found that exercise such as walking reorganizes brain neurons, helping people relieve stress and anxiety so they can experience more peace. Walking through a natural environment can change brain activity so people don’t ruminate on negative thoughts as much as they did before their nature walks, according to a research study by scientists from Stanford University and other organizations. The study showed that those who walked outside for 90 minutes experienced less stress as a result. When you walk, your mind’s attention centers on basic, fundamental focuses: simply putting one foot in front of the other and noticing what’s around you. You’re not as concerned with what you’re doing as much as you are with just being. That’s why walking promotes mindfulness, which in turn promotes peace. If my mind starts spiraling into stress, I’ll try to take a walk. Walking quiets my mind and gives me a clearer perspective on any situation that had been making me feel anxious. Usually when I take a walk specifically to relieve stress, I’ll meditate on, or pray about, that intention as well. Then the peace I experience deepens to become especially strong. As I take each step on a walk, I let go of my worries. Step by step, I transfer the energy of my thoughts from negative (worry) to positive (trust in God). Walking enriches the process by giving me a foundation of relaxation on which to build. How has walking helped you experience peace in your own life? What stressful situations are you going through right now that you could think about more clearly on a walk? How could that clearer perspective give you the peace of mind you need to navigate those situations well? Walking for 30 minutes boosts people’s moods by increasing their feelings of well-being, according to a University of Texas research study. Even those who had been diagnosed with depression reported experiencing better moods after taking a walk. I was in a bad mood one summer night after fruitless discussions with some family members while trying to resolve an issue. Frustration and sorrow hung over me like a wet blanket. So I decided to try to walk it off. Setting off from my yard, I walked around the neighborhood as thoughts about the conflict swirled around in my mind. I was ruminating on a negative subject, but still found my mood improving after a few minutes. Fireflies flew past me shining their lights, crickets chirped around me, and a warm breeze enveloped me as I kept walking. I hadn’t noticed the wonder of the summer night when I first began walking since thoughts about the family drama had weighed so heavily on my mind. But the more I walked, the more I gained a better perspective. By the time I returned home, I was in a good mood. How about you? If you’re in a bad mood while you’re reading this, take a walk as soon as you can. If you’re in a good mood, great! Try to walk for at least 30 minutes on a daily basis to keep both your emotions and your body strong. Need a fresh idea? Take a walk. The simple act of walking rejuvenates your mind as well as your body. 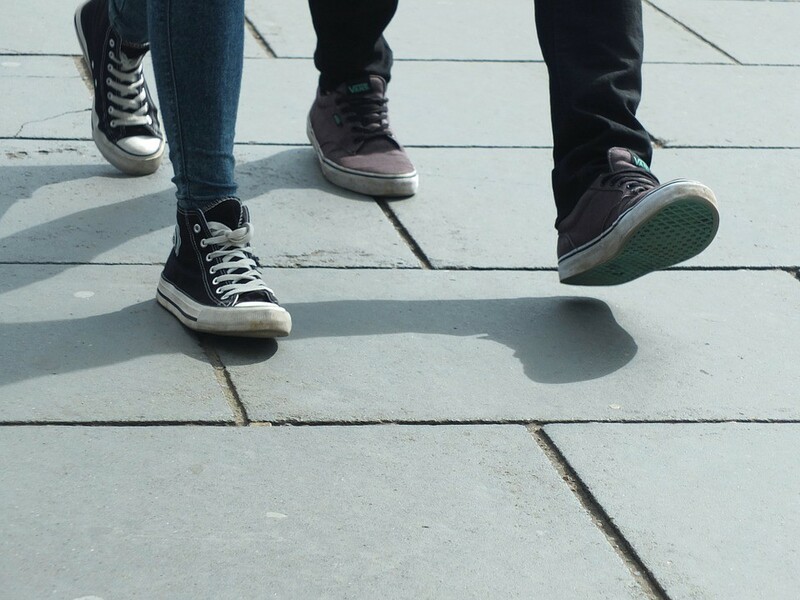 A Stanford University research study found that people boosted their creative inspiration by an average of 60 percent just by walking. Many of my best writing ideas have come to me while I was walking. If I’m struggling with writer’s block, I’ll take an office break for about 20 minutes to walk. Always, I return to my desk afterward with a breakthrough idea. Sometimes solutions to problems will come to me on one of the walks I take around my neighborhood regularly. At other times, my mind will make new connections between the details of my life, helping me understand situations better as I walk. How often have you noticed new insights coming to you during a walk? Whether you’re hiking through a park or simply strolling down a hallway, your mind is a magnet for new ideas because walking promotes clear thinking. That’s why some people pace back and forth across a room while they’re trying to figure something out. When you move your body, your mind moves forward, too. Exercise such as walking helps the brain grow new cells — especially in the hippocampus region that relates to memory and cognition, says Preventive Medecine Research Institute founder Dr. Dean Ornish. Walking has helped me remember something important on many occasions. One day, I took a walk to solve the mystery of mysterious noises in our home’s attic. As I walked, the details of different instances came to mind, so I could connect the dots between the various clues. There were several times I heard running and bumping sounds. On one occasion, I remembered, those sounds were accompanied by noises that seemed like animals chattering. I also recalled seeing shredded bits of wood showing up inexplicably at a place that was located right below the attic. After walking boosted my memory, I solved the mystery: It was squirrels! They had invaded the attic, and the strange sounds were coming from them scrambling around and chattering with each other. Thanks to that memory walk, I figured out what was going on in enough time to evacuate the squirrels and prevent significant damage to our home. What are you having trouble remembering right now? Mull it over during a walk. Afterward, make a note of the new insights that came to mind while you were walking. Hopefully you won’t have squirrels in your attic, but some new cells in your brain for memory wouldn’t hurt! Walking strengthens your ability to focus mentally. A Harvard Medical School research study revealed that walking and other forms of regular exercise enhance concentration by releasing brain chemicals that help people concentrate. Often, I’ll take brief walks on weekday afternoons to help me concentrate better on my work. By the time late afternoon rolls around, my physical energy slows down and my mental energy slumps, too. That’s when I’m most prone to getting restless and distracted. Clicking over to YouTube for a brief break to watch a funny cat video is tempting, but will only distract me more, so when I’m having trouble focusing I take a brief walk instead. The physical rhythm of walking sets our mind in sync with a healthy rhythm, as well. It lets all the discordant thoughts that run chaotically through our minds drop away, and focuses us on thoughts that are worthy of our attention. Even though it seems counter intuitive, taking breaks from our work to enjoy some walks can actually make us more productive than continuing to work when we’re distracted. Walking takes time, of course, but it’s a wise investment to make. The concentration boost increases productivity that empowers us to more than make up for the time spent walking. So let’s walk — for our minds as well as our bodies — whenever we can!